The Suzuki I drive is a 1992 model. 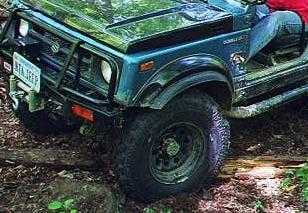 In 1990 Suzuki switched to an all metal fender. The previous models had simple and much more flexible (and forgiving) plastic fenders. The fenders on my Suzuki were rough, dented, full of body putty and repairs by the previous owner were slapped together. I added my share of 'trail dings' and it was time to replace them. I could buy new fenders from the Dealer, Purchase a set of costly aftermarket flares and hope that they would fit my year, Hit the junkyards, or go with a cheaper and easier alternative. The dealer laughed at me when I asked about new replacements and roaming the junkyards looking for a set of metal flares was going to be about as easy as finding an honest politician. I didn't have the $300.00 for a set of aftermarkets and had heard that a set of rear flares from a Jeep Wrangler could be made to fit. To me this was sounding like a solution. They were cheap, easily replaced, and would flex instead of 'wrinkle' like my original flares. I started off at the rear, removing what was left of my right rear fender, Since the fender was trash and wasn't worth saving I just went ahead and used the grinder and cutting wheel and got it off the best way I could. The mount for the fender is held on with spot welds. I didn't have a spot weld drill bit, I didn't want to drill holes totally through so I 'faced' the spot welds with a grinder and they just 'popped' out. I'm glad that I was able to get it off too as rust was starting to take hold. The flexible fenders had an inside lip that I cut off with a utility knife. Once this was done the fender laid up nicely for adjustment. I taped it to the side and marked the holes to predrilled. I used sheetmetal screws with fender washers to hold it properly to the side. Because of the shape of the fender differing from the standard flare the holes will protrude into the cargo bay. This is of little consequence because I cut pieces of trimbrite (Aluminum Diamond Plate) for replacements of the original inside panels. I'll have a write-up of this soon as well. NOTE: Disclaimer: The fabrication and modifications and designs you see here have been done by myself (some with help), for myself, Miles D. Oliver. I hold no Mechanical, structural, or Engineering degrees. If you duplicate these modifications you do so at your own risk. I do not endorse or make any claims to their safety, performance, On-road or off-road worthiness.